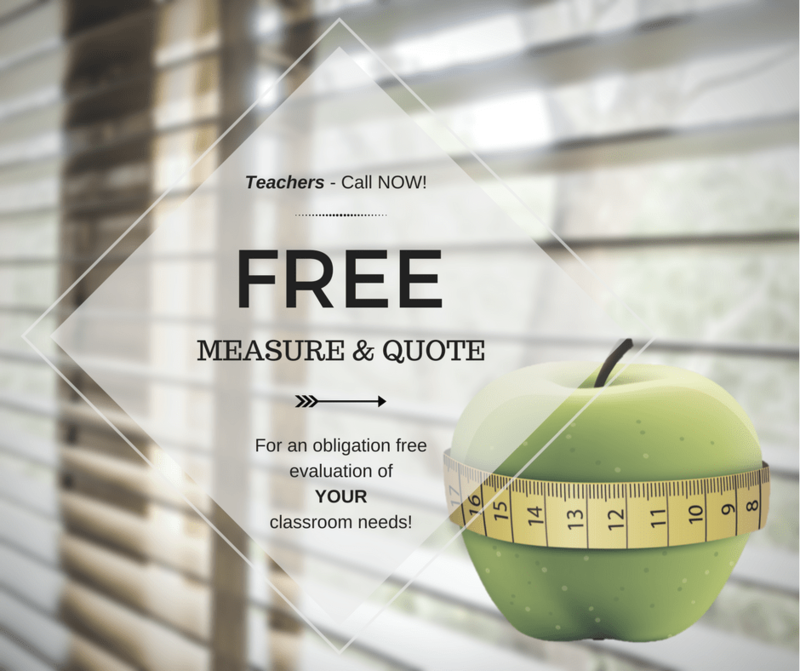 Call now – For an obligation free evaluation of YOUR classroom needs! Oh, if it were only so easy. Right? I recently decided it was time to replace the broken blinds in my family room. You know when blinds lose their spring and they just roll down? We have them jammed at the top to stop them from moving. But obviously that is not a long-term solution. And particularly impossible on days when the sun streams in on my hands and screen. It feels warm. But I have a lot of difficulty seeing what I am doing! So, I called in a blind company. Free measure and quote. The assortment of options was amazing. I could choose so many different types, colours, patterns. See through, block-out. The choices were endless. I had some criteria – colour, pattern style, double roller. But it was a difficult choice – I am glad she had the swatches so I could see what I liked! If only I could have that for my classroom. Call in a specialist who would evaluate my classroom for FREE! Then tell me what curriculum frameworks I should use that would suit my whole class. And for an extra cost – write it all up for me. Even develop the curriculum. And away I go! YES! The reality is we do have specialists. School psychologists, social workers and counselors. They give us valuable information of the needs of our specific children. But we now need to develop the curriculum that will suit them. How do we go about doing that, within the context of our classroom environment? A classroom that has 28 or so other children in it. I have written before how you can use curriculum frameworks to help you plan for an inclusive classroom. But how do you go about choosing the right one for you? For your classroom? For your students? Let me introduce you to five criteria that you should consider. Let me start by emphasizing that not one Framework will do what you need it to do. As I discovered when hanging my blinds – I have some that are block-out, some that are sun sheers, and even a lovely fabric roman blind. They all work together in a complementary way. Similarly, we need to look for complementary frameworks. We need to choose a framework that is appropriate to our circumstances. That will comprehensively cover all our contexts and needs, yet one that is flexible and adaptable. And of course, it should be practical – no point in choosing a framework that is so theoretical, we are not sure it will ever work. Finally, I recommend one that is well supported by an extensive body of research – so you know it works! Curriculum area – first of, you need to consider the curriculum area you are teaching in. How does the model approach the teaching of your curriculum area? Some frameworks are suited better to a specific subject – for example, the curriculum cycle (coming soon) works well in the humanities. But others, such as William’s Model, were designed to work across all areas of the curriculum. Teaching Process/strategy – What are the teaching and learning processes you wish to use – what does the framework suggest? You need to be comfortable with the approach suggested. Most frameworks give you guidelines for developing specific learning experiences – such as William’s 18 Teaching Behaviours. Read through these carefully and consider how you would use them in your classroom. Product – what are the products which the framework suggests you develop? Some of them are quite explicit – such as Maker’s Model with a focus on the Real world. Is this something you can do in your classroom? Learning Environment – what is your context? How adaptable and flexible is your space? This will affect how you approach your teaching and what teaching strategies and products you will choose. If you are fully flexible you might choose the Universal Design for Learning framework (coming soon), or Maker’s Model, which is a very student-centred approach. Suited best for which of my students? Each of the curriculum frameworks make explicit and implicit assumptions about learners, you need to be aware of these, before you choose which one you wish to use. A good understanding of the frameworks, will help you make the best choice about which students it is best suited to. But also, how they can then be best adapted to suit your classroom needs. So, I can hear you asking, “Does that mean each year I have to go through the process of deciding on which curriculum framework to use?” Yes. Because unlike my new blinds – your programming and planning will not last for five or even ten years. Each year you have a new group of students. So, each year will bring some changes. However, I have developed a FREE Curriculum Planner printable for you to complete, to help you make those decisions quickly and easily. Then all you need to do each year is to go back to the Curriculum Planner, and make your choices based on the information you have already filled in. If you are ready to get your classroom planning sorted, I invite you to download the classroom Curriculum Planner now. Download my copy of the FREE Curriculum Planner printable! Do you need help filling out your Curriculum Planner printable? I have developed a course which takes you through understanding the Curriculum Frameworks listed on the Planner. The introductory course helps you to Plan your Classroom for Inclusion. I tell you all about 3 key curriculum frameworks, and shows you how to use them for your planning. The BONUS? When you have completed the course, you can add 5 hours to your professional development log. And if you live in the Australian Capital Territory, you automatically qualify for 5 hours of Accredited Professional Learning.